This page documents notable tornadoes and tornado outbreaks worldwide in 2015. Strong and destructive tornadoes form most frequently in the United States, Bangladesh, Brazil and Eastern India, but they can occur almost anywhere under the right conditions. Tornadoes also develop occasionally in southern Canada during the Northern Hemisphere's summer and somewhat regularly at other times of the year across Europe, Asia, and Australia. Tornadic events are often accompanied with other forms of severe weather including strong thunderstorms, winds and hail. Graph of the 2015 United States tornado count. There were 1,265 tornadoes reported in the United States in 2015 according to the Storm Prediction Center (SPC), of which at least 1,178 have been confirmed. Worldwide, 109 fatalities have been reported: 45 in Pakistan, 36 in the United States, 14 in Mexico, 7 in China, 3 in Myanmar, 2 in Brazil and 1 each in Italy and Russia. 2015 ended the very quiet trend of the 2012, 2013 and 2014 seasons, and was the most active in four years. Throughout much of the first half of 2015, tornado activity was near record low mostly due to a continuous pattern of a trough in the east, which brought colder than average temperatures there, and a ridge in the west, which brought warmer than average temperatures in the west. The pattern changed, slightly, in late March and early April to allow for some severe weather. During May, a few large tornado outbreaks occurred, which led it to be the most active tornado month since April 2011, and the most active May since 2008. Due to a significant El Niño event, November and December were extremely active months with over 20 fatalities in December alone. 93 tornadoes were reported in December, well above average for that month. Furthermore, 2015 was the first year since 2011 to see a total of more than 1,000 tornadoes across the United States. 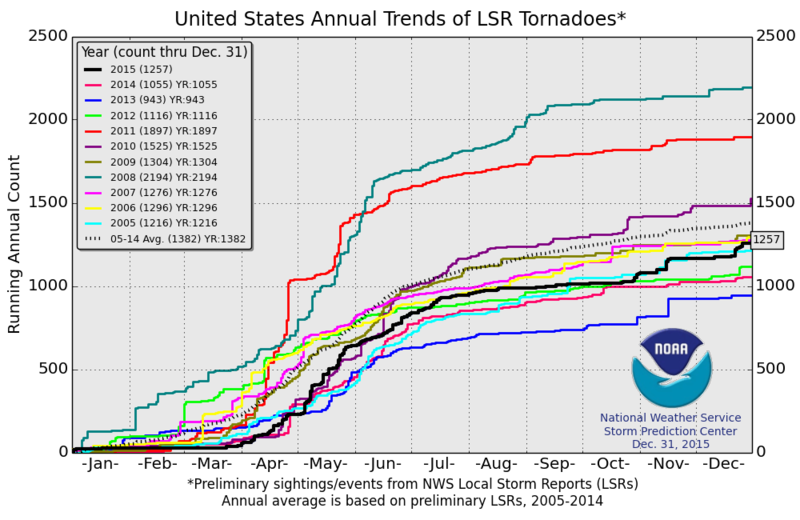 In synopsis, 2015 was the first average or above average year in terms of the number of tornadoes since 2011. There were 32 tornadoes reported in the U.S. in January, of which 27 were confirmed. On January 1, the Storm Prediction Center (SPC) began highlighting the potential for severe weather across portions of the central Gulf Coast and lower Mississippi Valley. The following day, the pre-existing Marginal risk was upgraded to a Slight risk across southeastern Louisiana, southeastern Mississippi, and southwestern Alabama. On January 3, the combination of high dewpoints, marginal instability, and strong wind shear allowed for the development of supercells across central and southern Mississippi, where an Enhanced risk was briefly introduced. An EF2 tornado touched down west of Rose Hill, Mississippi, causing significant damage, while several other tornadoes were recorded. Activity spread eastward on January 4, with a second EF2 tornado causing substantial damage north of Dozier, Alabama. There were 2 tornadoes reported in the U.S. in February, both of which were confirmed. There were 13 tornadoes reported in the U.S. in March, of which 11 were confirmed. Early on March 24, the SPC outlined an Enhanced risk for severe weather across portions of southwestern Missouri, northwestern Arkansas, and northeastern Oklahoma, where conditions were expected to become favorable for strong supercells. That afternoon, a waterspout over Bull Shoals Lake moved ashore as an EF0 tornado but caused no damage. Numerous reports of damaging winds and hail were relayed. On March 25, a more substantial severe weather risk evolved across southwestern Missouri, northwestern Arkansas, and northeastern Oklahoma, where the SPC outlined the year's first Moderate risk. At 22:21 UTC, a waterspout spawned over Keystone Lake and moved through Sand Springs, Oklahoma, causing EF2 damage in a mobile home park where one fatality and 30 injuries were observed. At 23:34 UTC, a second EF2 tornado developed and tracked through southwestern Oklahoma City, Oklahoma, before entering Moore. Several structures sustained substantial damage, and several cars were flipped and overturned on Interstate 35. Several other weak tornadoes touched down in adjacent states as well. There were 185 tornadoes reported in the U.S. in April, of which 171 were confirmed. On April 2, a tornado of unknown strength struck the city of Bikaner in Rajasthan, India. At least 50 families were displaced by the storm. On April 2, upper-level southwesterly flow overspread the Ozarks and Ohio River Valley, where an Enhanced risk for severe weather was introduced by the SPC. A surface low tracked into Ontario, supporting a cold front down into southern Missouri. Throughout the afternoon hours, a shortwave trough tracked across the Central Plains, providing ample lift for the development of severe thunderstorms. Several weak tornadoes were recorded. On April 3, the Enhanced risk shifted southeast, encompassing portions of Kentucky, Tennessee, Mississippi, and Alabama. An EF2 tornado tracked north of Pomona, Missouri, in the pre-dawn hours, damaging or destroying several buildings. Several tornadoes of lesser intensity were observed farther east. On April 6, three people were killed and five others were injured when a tornado struck two villages within Phakant, Kachin State, Myanmar. A two-day severe weather episode affected parts of the Great Plains and Midwestern United States. Several EF0 tornadoes occurred on April 8 in the south central part of Kansas, including some to the northwest of Wichita, Kansas, near the towns of Garden Plain and Andale. An EF1 tornado caused moderate damage as it struck the town of Potosi, Missouri, that evening as well. Several tornadoes were also reported from Texas to Illinois on April 9. A multiple-vortex EF1 tornado struck the towns of Clinton, Iowa, and Fulton, Illinois, and an EF2 tornado near Mount Selman, Texas snapped and uprooted numerous trees, damaged outbuildings, and removed the roof and collapsed a few exterior walls at a frame home. The most significant event of the outbreak was a violent, long-tracked, very high-end EF4 wedge tornado that moved along a 30.14 mile-long path across several counties in northern Illinois, killing two people and injuring another 22. An EF0 satellite tornado also caused major damage to outbuildings at the Summerfield Zoo near Belvidere, where two animals were killed. Two other EF1 tornadoes from the same parent supercell also occurred near Belvidere after the main EF4 dissipated, causing mostly minor damage, though one home lost most of its roof. Another tornado spawned by a separate supercell passed near Cherry Valley, though it remained over open country and caused no damage. Overall, this relatively small outbreak produced 2 fatalities and 24 tornadoes. A long-tracked, rain-wrapped F3 wedge tornado spawned by a supercell thunderstorm struck the city of Xanxerê, Santa Catarina in Brazil during the afternoon of April 20. Approximately 500 homes were damaged in the city, many of which lost their roofs and some were destroyed. Many trees and power lines were downed, trees were snapped and debarked, and industrial buildings sustained major damage as well. Two people lost their lives. Additionally, 120 people were injured, 15 critically. The meteorological consulting agency MetSul Meteorologia stated it was one of the largest tornadoes ever recorded in Brazil. Roughly 1,000 people were forced out of their homes due to the storm. The city of Ponte Serrada was struck by an F1 tornado on the same day. There were 414 tornadoes reported in the U.S. in May, of which 383 were confirmed. An F3 tornado hit the German town of Bützow, Mecklenburg-Vorpommern, causing major structural damage, littering streets with debris, and flipping vehicles. One car was reportedly thrown 70 meters by the tornado. Video evidence showed that the town was hit by a multiple-vortex, wedge tornado. Moreover, straight-line thunderstorm winds killed one person and injured 30 others in Hamburg. This event followed an episode of unusually warm weather in the area. EF3 damage to a house in Van, Texas. A six-day outbreak of tornadic activity began on May 5 with isolated tornadoes in western Texas. More widespread and significant activity occurred on May 6. Much of central Oklahoma experienced tornadoes, and the town of Bridge Creek sustained major impacts from a large EF3 tornado, where several businesses and homes were heavily damaged or destroyed. Another EF3 tornado caused major damage in southwestern parts of Oklahoma City, just north of Valley Brook, where a hotel, several self-storage units, a mobile home park, and an RV park were heavily damaged, numerous vehicles were flipped, and at least 12 people were injured. Large, strong tornadoes, including two EF3 tornadoes, severely damaged or completely destroyed rural homes near the Kansas towns of Mount Hope, Scandia, and Munden. Several additional less intense tornadoes occurred on May 7 and May 8 across an area extending from Colorado to Texas. Another wave of significant tornado activity occurred on May 9 throughout an area extending from Nebraska to Texas. This included a large EF3 tornado that caused major damage and killed one person near Cisco, Texas. Destructive tornado activity continued on May 10, as a high-end EF2 tornado struck the town of Delmont, South Dakota, where severe structural damage and injuries occurred. Later that evening, a multiple-vortex EF1 tornado struck Lake City, Iowa, where homes were damaged, trees and power lines were downed, and the local high school had its roof torn off. Significant tornadoes continued to touch down after sunset later that night, and the town of Van, Texas, was devastated by a strong EF3 tornado, where two people were killed and 47 others were injured. Two other fatalities occurred in Nashville, Arkansas, when an EF2 tornado struck a mobile home park. A total of 127 tornadoes were confirmed and rated as a result of this outbreak sequence. One F3 tornado which caused severe damage to many well-built brick buildings was confirmed in the district of Aichach-Friedberg north of Augsburg, Bavaria. Two more tornadoes were confirmed in the southern part of the Black Forest, Baden-Württemberg. A two-day tornado outbreak affected the Great Plains states beginning on May 16. Most of these tornadoes were weak, though a few significant tornadoes occurred, including a large and long-lived multiple-vortex wedge tornado that tracked from near Chillicothe, Texas, to near Snyder, Oklahoma, causing significant damage to farming equipment, trees, and a few structures along its path. The tornado was caught on video by numerous storm chasers as it passed near Elmer, Oklahoma. Based on radar and video evidence, surveyors determined that it was likely a violent tornado capable of producing EF4 or greater damage, though due to the fact that the tornado remained over very rural areas throughout most of its life and never directly impacted any substantial structures, the highest rating that could be applied was EF3. Two EF2 tornadoes also caused heavy damage near the town of Inola, Oklahoma later that evening, one of which damaged up to 120 homes. Further east, an EF2 tornado destroyed a mobile home and damaged frame homes near Sibley and Orrick, Missouri. Numerous additional weak tornadoes occurred mainly across Iowa, Oklahoma, and Missouri the following day. Overall, the outbreak produced 60 tornadoes and no deaths. A large storm system that resulted in catastrophic flooding produced numerous tornadoes across the Great Plains on May 23 and 24. Most of these tornadoes were weak, though EF2s caused considerable damage near New Boston, Illinois, and Ensign, Kansas. In Texas, EF1 tornadoes impacted mainly residential areas of Dallas, Houston, and Corpus Christi as well. In the early morning hours of May 25, a destructive tornado struck the Mexican border city of Ciudad Acuña, Coahuila; it was the first twister to strike the city in its history. Numerous cars and buses were thrown and mangled, and 750 properties were damaged or completely destroyed. Several masonry construction homes along the path were completely leveled. 14 fatalities occurred as a result, and an additional 229 residents were injured. The tornado was officially rated F3, though some sources list it as an F4. Additional tornadoes, a few of which were strong, touched down in Texas later throughout the day. This included an EF2 that killed one person near Cameron, Texas. Another EF2 struck Henderson, causing considerable damage in town. In Oklahoma, an EF2 caused heavy damage near the towns of Wister and Panama, while an EF3 killed one person near Blue. Overall, the outbreak produced 75 tornadoes and killed 16 people, making it the deadliest North American tornado outbreak of 2015. There were 184 tornadoes reported in the U.S. in June, all of which were confirmed. On June 4, severe thunderstorms developed over north central Colorado and produced a total of 20 tornadoes, most of which were weak. However, there was one EF3 tornado that damaged 25 homes, destroyed three of them, and debarked small trees near Berthoud, Colorado. The tornado moved on an unusual westward track and was the first EF3 tornado in Colorado since 2008. Another supercell dropped 19 weak tornadoes near Simla, Colorado over the course of about three hours. Three of them were rated EF1 and the rest were rated EF0, and some of the tornadoes were anticyclonic. In addition, large hail also fell in Boulder and Elbert counties. High-end EF3 damage to a house in Coal City, Illinois. A damaging outbreak of strong tornadoes impacted the Great Lakes region of the United States from June 22 to June 23. The most significant activity occurred on the 22nd, including a high-end EF1 tornado that damaged numerous structures in Portland, Michigan early that afternoon. Later that evening, a strong, rain-wrapped EF3 partially debarked trees and swept away an unanchored house near Lovilia, Iowa, before weakening and striking the town of Albia at EF1 strength. A separate EF2 tornado from the same cell heavily damaged homes and businesses west of Albia as well. As the evening progressed, numerous tornadoes began touching down across northern Illinois and in Michigan as well. An EF2 struck the south side of Edgington, Illinois, tearing roofs off of homes, destroying garages, and snapping large trees. Another large EF2 wedge tornado caused major damage at the Woodhaven Lakes Campground near Sublette, flattening a large swath of trees, destroying or tossing numerous recreational vehicles and mobile homes, and injuring seven people. In Michigan, an EF2 tornado severely damaged two homes and downed numerous trees near the town of Millington. The strongest and most destructive tornado of the outbreak initially touched down after dark as a weak tornado south of Morris, Illinois, causing roof and chimney damage to homes, and downing trees and power poles as it moved along a southeasterly path. The storm intensified and widened rapidly as it entered Coal City, reaching nearly a mile wide in diameter and attaining high-end EF3 strength. Numerous anchor-bolted frame homes in Coal City were damaged or destroyed, and a few were leveled or swept from their foundations (though vehicles parked at these residences were not moved, and nearby vegetation was not defoliated or debarked, precluding a higher rating). Two large high-tension metal truss towers were toppled to the ground in Coal City as well. The tornado weakened to EF2 strength as it struck the neighboring town of Braidwood, heavily damaging trees, power poles, and a motel in the southwestern part of town. The tornado moved out of Braidwood and maintained EF2 strength as it continued along its southeasterly path through rural areas, rolling a recreational vehicle, damaging the roof of a frame home, snapping numerous power poles, and completely destroying an outbuilding before dissipating. The outbreak continued the following day as a few weak tornadoes were observed in Michigan, Ohio, and Massachusetts. Overall, this outbreak produced 28 tornadoes, though no fatalities occurred. There were 122 tornadoes reported in the U.S. in July, of which 115 were confirmed. A violent EF4 tornado impacted areas in and around the towns of Pianiga, Dolo and Mira, causing major damage and several casualties within the Riviera del Brenta region of Italy, famous for its villas and channels. About 500 buildings were badly damaged or destroyed, and among them was the large, two-story, masonry construction Villa Fini restaurant and hotel from the 17th century, which was almost entirely leveled to the ground. Many trees were defoliated, snapped, and partially debarked, and numerous cars were tossed and mangled, a few of which were thrown into canals and submerged. As the tornado impacted rural areas, homes and farmsteads were severely damaged or destroyed, metal high-tension truss towers were toppled to the ground, and agricultural fields were scoured. One person was killed, and at least 72 people were injured. A slow-moving EF3 stovepipe tornado occurred near Nickerson, Kansas, on the evening of July 13, completely debarking trees and cleanly sweeping away an unanchored farm home. The tornado was highly visible from the nearby town of Hutchinson, and was photographed and caught on video by many local residents. A few additional weak tornadoes occurred across parts of Indiana, Kentucky, and Wisconsin that evening as well. A localized outbreak of nine tornadoes impacted Iowa and Illinois on the evening of July 16. A few of these tornadoes caused significant damage to towns, including a large multiple-vortex EF2 that passed near the Illinois town of Monmouth and struck the nearby town of Cameron. Homes in Cameron had their roofs ripped off, large grain bins were destroyed at a granary in town, and trees were snapped as well. Another EF2 near Kirkwood destroyed barns and outbuildings and snapped power poles along its path. The most significant tornado of the event was a damaging EF2 that heavily damaged numerous homes, completely destroyed many garages and outbuildings, and snapped numerous trees in the southern part of Delavan, Illinois. Some homes had their roofs torn off, and one had its entire second story ripped off. In total, the Delavan tornado damaged 51 homes in town, 15 of which sustained major impacts. The tornado developed and dissipated so quickly that a tornado warning was never issued. A long-lived tornadic supercell tracked approximately 80 kilometers (50 mi) across southern Manitoba for up to three hours, producing tornadoes. The tornadoes moved along a sharp northeasterly path, remaining over very rural areas as they passed near the towns of Pierson, Melita, Tilston, Reston, and Virden. Very few structures were impacted in this sparsely populated area, though a few farmsteads sustained some damage. Numerous trees and power poles sustained major damage along the storm track, and asphalt was scoured from a highway bridge near Melita. No injuries occurred as a result of these tornadoes. Due to the rural nature of the affected area, no significant damage occurred, none of the tornadoes were rated higher than high-end EF2. There were 44 tornadoes reported in the U.S. in August, however, 47 were confirmed. Four confirmed tornadoes touched down in the Chicago Metro area, two in suburban areas just south and west of Milwaukee, and lastly an EF1 that caused damage outside of Lake Geneva. Although tornadoes are extremely rare in the Netherlands, Wieringerwerf was struck by a small but destructive tornado during a severe weather event on the afternoon of August 24. The storm damaged 4 farms. Around 5 p.m. local time, a tornado touched down near Dubbo, in the Central West region of New South Wales and in its 200 meter wide path through a semi-rural area damaged homes, sheds, and vegetation. There were 24 tornadoes reported in the United States in September, of which 17 were confirmed. A damaging F2 tornado struck the small village of Sonnac in southern France. Well-built homes had their roofs torn off, with some partial collapse of brick exterior walls observed. Major tree and outbuilding damage occurred as well. There were 57 tornadoes reported in the United States in October, of which 40 were confirmed. Several strong tornadoes impacted the Guangdong region of China killing 7 people, injuring over 223, and leaving 16 others missing. Three significant tornadoes occurred in Guangdong Province, impacting Foshan, Guangzhou, and Haifeng County. Two of these tornadoes impacted densely populated areas, leaving major damage. Homes were reportedly ripped apart and vehicles were overturned. The tornadoes were spawned by Typhoon Mujigae, which was approaching the area at the time. The Canton Tower had to be evacuated during a blackout throughout the whole province during the storms. EF2 damage to an industrial building in Pasadena, Texas. A small tornado outbreak occurred across Texas, Louisiana and Mississippi during a major flooding event. The first two tornadoes touched down in southern Texas during the early morning hours of the 30th, including an EF1 in Los Coyotes that was caught on surveillance video lifting a barn from its foundation and destroying it. Other outbuildings and trees sustained damage along the path as well. Another EF0 near Willamar knocked over a cotton seed holder and snapped tree limbs. More intense tornado activity occurred later on the 30th, as tornadoes impacted areas in and around the greater Austin and Houston areas, a few of which were strong. An EF0 struck the town of D'Hanis early in the morning, causing tree and roof damage throughout town. One frail, older brick building in the downtown area had its second story collapse. The town of Floresville sustained a direct hit from a strong EF2 tornado, where extensive tree and roof damage occurred, a billboard was collapsed, and recreational vehicles were thrown and destroyed, including one that was lifted and deposited on the roof of a three-story hotel. The local high school was severely damaged, sustaining two major exterior wall collapses on the second floor, as well as partial collapse of its roof. Another EF2 tornado damaged at least 25 homes near the town of Geronimo. Some of the homes sustained total roof loss, and mobile homes were rolled and destroyed. Numerous trees were downed, and outbuildings, garages, and pieces of farm equipment were damaged or destroyed as well. During the early morning of October 31, ten tornadoes touched down in the densely populated Houston Metropolitan Area. An EF0 tornado struck a mobile home park near Alvin, causing minor damage to 20 mobile homes and overturning one of them, injuring the couple inside. An EF1 tornado also occurred near Manvel destroying a mobile home and damaging 5 others, injuring three people. Another EF0 tornado caused roof damage to the Brazos Mall in Lake Jackson. One tornado struck the Houston suburb of Friendswood, causing mostly moderate tree and roof damage, though one well-built house had most of its roof torn off, warranting an EF2 rating. Another strong tornado began at the southeast edge of Pasadena before tearing through densely populated areas of La Porte. The most intense damage occurred in Pasadena, where a metal-frame industrial building was destroyed at EF2 strength. Significant tree and roof damage occurred in La Porte, where one home had most of its roof torn off and another was shifted off of its foundation. Many other homes sustained lesser damage. A third EF0 also touched down later in the morning, causing minor damage to homes in Highlands and Barrett. Tornadoes continued to touch down in areas further east later in the day, as weak tornadoes touched down in Louisiana and Mississippi. An EF0 tornado struck residential areas of Hattiesburg, Mississippi, causing minor tree and roof damage. Overall, this outbreak produced 24 tornadoes, though no fatalities occurred. There were 95 tornadoes reported in the United States in November, however, 98 were confirmed. A severe spring storm outbreak over eastern Australia caused one or possibly more tornadoes in northern Victoria. A multiple-vortex tornado was filmed in Nathalia, causing severe damage to farm buildings. Possibly the same tornado uprooted trees and damaged ten homes, destroying three in nearby Strathmerton. On Veterans Day, a powerful low-pressure system spawned a localized tornado outbreak, mainly across parts of central Iowa. Most of these tornadoes were weak, though a few were strong or caused considerable damage. This included an EF2 tornado that caused heavy damage to rural properties near Rathbun Lake, tearing roofs off of homes, shifting other homes off of their foundations, destroying outbuildings, and snapping power poles. Another EF2 tornado destroyed a well-built barn near the beginning of its path before weakening and striking Barnes City, Iowa, as an EF1, resulting in moderate tree and outbuilding damage in town. EF1 tornadoes also struck the Iowa towns of Le Claire and Knoxville, causing moderate damage. One EF0 tornado was observed and reported by air traffic controllers as it caused minor damage at the Des Moines International Airport. Overall, the outbreak produced 22 tornadoes and no fatalities or injuries. Building at a chemical plant that was leveled by the second EF3 tornado near Pampa, Texas. On November 16, an unusual late-season nocturnal tornado outbreak produced numerous tornadoes in parts of Texas, Oklahoma, Kansas, and Nebraska during the late evening and overnight hours. A long-track EF3 wedge tornado began northeast of Liberal, Kansas, and moved along a 51-mile-long (82 km) path through several counties before dissipating near Montezuma, causing extensive damage to farmsteads and trees along the path. Trees were partially debarked and denuded, homes were heavily damaged, a well-built metal frame hog containment building was obliterated, and a heavy steel oil tank was thrown by this strong tornado. Another large EF2 wedge tornado spawned by the same supercell caused considerable damage in rural areas between the towns of Ensign and Cimarron as well. A separate supercell storm also produced an EF2 tornado that caused damage to farms near Ness City as well. The towns of Grainfield and Lenora sustained direct hits from EF1 tornadoes, resulting in moderate damage at both locations. Further to the south, a large EF3 wedge tornado passed to the southeast of Pampa, Texas, before dissipating near Miami, debarking trees, toppling metal high-tension truss towers, and causing some ground scouring as it passed through rural areas. A well-anchored mobile home was completely swept away with little debris recovered, and nearby heavy farm equipment along with a two-ton truck were thrown 150 yards away. Shortly after the initial Pampa tornado, a second large EF3 passed to the southeast of the city, missing densely populated areas by just three miles. This large cone tornado leveled a large chemical plant complex on the outskirts of town, tossed vehicles, and destroyed a manufactured home. The destruction of the chemical plant complex resulted in a major gas leak and chemical spill, prompting a Hazmat team to respond. A large EF2 tornado passed near Groom, heavily damaging a frame home, destroying a well-built metal frame outbuilding, and moving a flat-bed truck 50 yards, while another EF2 heavily damaged a well service rig near Seminole. As the supercells crossed into the Oklahoma panhandle later that night, additional tornadoes touched down, including an EF2 that caused damage near the town of Fort Supply. Many other tornadoes were sighted in rural areas across the four states that night as well, though they remained mostly over open country and caused minimal damage. Due to the highly anomalous time of year and geographical locations of the outbreak, the National Weather Service office in Dodge City, Kansas described the event as being "unprecedented in recorded history for southwest Kansas". The parent storm system went on to produce additional weak tornadoes across the southern United States on the 17th and 18th, some of which impacted suburbs of Dallas and Atlanta. Overall, the outbreak produced 61 tornadoes, though no fatalities occurred. Three different tornadoes were sighted in three cities in the late afternoon: Marechal Cândido Rondon, in the state of Paraná (F1); Chapecó (F1) and Treze Tílias (F0), both in the state of Santa Catarina. In Marechal Cândido Rondon, the gusts reached the 115 km/h (71 mph) mark at 4:00 pm local time (UTC−02:00), leaving 20 people injured; several trees were toppled and approximately 1,500 houses were damaged, causing the disruption of the electricity service for 14,000 people. In Chapecó, the strong winds from a F1 tornado damaged 20 roofs, partially destroyed 6 houses and completely demolished another four. Four people were injured and the electricity service was cut in the evening. In Treze Tílias, a F0 tornado downed several trees and destroyed 10 roofs; a hospital was flooded and the electricity service was disrupted at 7:00 pm local time (UTC−02:00). There were 93 tornadoes reported in the United States in December, of which 83 were confirmed. A localized outbreak of eight tornadoes impacted parts of Oklahoma and Texas on December 12. This included three EF2 tornadoes caused considerable damage in Texas, the first of which struck the town of Lindale and damaged roughly 50 homes. Another EF2 caused major damage to large industrial buildings and RVs near Willis, while a third damaged or destroyed homes and mobile homes near the towns of Pickton and Saltillo, injuring two. Three people were also injured by an EF2 tornado that damaged 16 homes and destroyed 4 mobile homes near Valliant, Oklahoma. An estimated EF2 tornado spawned by a violent supercell hit parts of southern Sydney, New South Wales around 10:30am AEST. The suburb of Kurnell was hardest hit, with a confirmed wind gust of 213 km/h (132 mph) associated with the tornado. Numerous houses were partially destroyed, a major shopping centre and desalination plant were also damaged, whilst many trees were snapped and boats and trucks were reportedly flipped. Tennis ball sized hail and flash flooding with rainfall up to 144 mm (5.7 in) in an hour was also recorded from the same storm system, with damage reported across the Greater Sydney Area and the Illawarra. EF3 damage to a church in Lutts, Tennessee. On the evening of December 23, a significant tornado outbreak affected the Midwest and South, producing tornadoes mainly across Illinois, Michigan, Indiana, Mississippi, Alabama, and Tennessee. One of the first tornadoes of the event was an EF1 tornado that touched down in Greenwood, Indiana, where several homes sustained damage. Another EF1 tornado caused damage to homes in the Indianapolis suburb of Noblesville. Two other tornadoes were reported in Indiana - an additional EF1 near the Rush County/Decatur County Line and an EF0 in Wayne County near Fountaintown. In Illinois, an EF1 tornado destroyed outbuildings and downed trees near the town of Sciota. The outbreak also spawned the only known tornado to touch down in Michigan during the month of December, an EF1 that struck the Detroit suburb of Canton, causing considerable damage to vehicles, an industrial park, and a gas station. Farther south, a strong EF2 tornado occurred near Marianna, Arkansas, completely destroying mobile homes, tearing roofs off of frame homes, and damaging cabins in the area. A large, destructive high-end EF3 tornado touched down south of Clarksdale, Mississippi, killing two people and severely damaging or destroying about 15 homes in that area. The tornado continued to the northeast, later snapping trees and destroying homes near Marks and Como before dissipating. The parent supercell that produced the Clarksdale tornado then produced a new tornado, a violent wedge that grew to nearly a mile wide and devastated the southern edge of Holly Springs, where two people were killed and a motorsports park and many homes were destroyed. Additional people were killed further along the path near Ashland and Canaan as well, where the tornado reached EF4 intensity. Homes were swept away and pavement was scoured from roads in this area. The tornado killed another person near Walnut before it eventually crossed into Tennessee, destroying homes near Middleton and Selmer before lifting. The Holly Springs/Ashland tornado killed 9 people in all. Another destructive EF3 tornado struck the small community of Lutts, Tennessee after dark, destroying homes and a church, and completely flattening the local post office. Significant tornado activity continued through parts of Mississippi and Tennessee overnight, including an EF2 tornado near Linden that downed many trees and killed an elderly couple in their small, unanchored home. More tornadoes were reported the following day and on Christmas as well, including a high-end EF2 tornado that destroyed homes in Birmingham. Overall, the outbreak resulted in 36 tornadoes and 13 deaths. Damage in a residential area as a result of the EF4 Garland/Rowlett, Texas tornado. On the evening of December 26, a series of destructive tornadoes impacted areas in and around the Dallas–Fort Worth metroplex, resulting in fatalities and major damage across densely populated areas. An EF3 tornado ripped through subdivisions in Ovilla and neighboring Glenn Heights, destroying numerous homes, two churches, and severely damaging a school building. Later that evening, a large EF4 wedge tornado touched down in northeastern Dallas County with major damage occurring in Garland and Rowlett. The Garland/Rowlett tornado completely destroyed numerous homes and vehicles along its path and killed 10 people. Later that night, an EF2 tornado killed two people and caused major damage in Copeville, while an EF1 caused another fatality near Blue Ridge, leaving a total of 13 tornado related fatalities and making the event the deadliest tornado disaster in the Dallas–Fort Worth metroplex since the Dallas tornado of 1957. The parent storm system went on to produce several other tornadoes across the Southern United States throughout the next two days, including the second tornado to cause EF2 damage near Marianna, Arkansas within a six-day period. Overall, the storm system produced 32 tornadoes, along with significant snowfall and flooding. ^ "Storm Events Database: January 1 – April 30, 2015 Tornadoes". National Climatic Data Center. National Oceanic and Atmospheric Administration. 2015. Retrieved April 28, 2016. ^ "Storm Events Database: May 1 – May 31, 2015 Tornadoes". National Climatic Data Center. National Oceanic and Atmospheric Administration. 2015. Retrieved April 28, 2016. ^ "Storm Events Database: June 1 – October 31, 2015 Tornadoes". National Climatic Data Center. National Oceanic and Atmospheric Administration. 2015. Retrieved April 28, 2016. ^ "Storm Events Database: November 1 – December 31, 2015 Tornadoes". National Climatic Data Center. National Oceanic and Atmospheric Administration. 2015. Retrieved April 28, 2016. ^ "Annual U.S. Killer Tornado Statistics". Storm Prediction Center. National Oceanic and Atmospheric Administration. Retrieved January 20, 2016. ^ "2015 Tornado Count". Storm Prediction Center. National Oceanic and Atmospheric Administration. Retrieved February 6, 2016. ^ "Annual U.S. Killer Tornado Statistics". Storm Prediction Center. National Oceanic and Atmospheric Administration. April 9, 2015. Retrieved April 10, 2015. ^ Jeras, Jacqui (March 24, 2015). "Unprecedented Quiet Start to Tornado Season - StormWatch 7". WJLA.com. Archived from the original on April 26, 2015. Retrieved May 7, 2015. ^ "Tornadoes - May 2015". 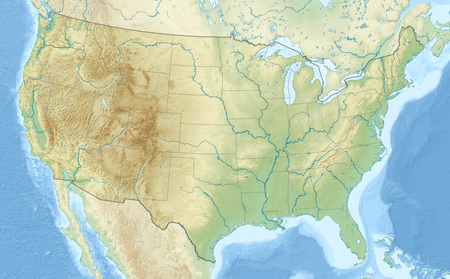 National Centers for Environmental Information. ^ "Severe Weather Reports of December 2015". spc.noaa.gov. December 31, 2015. Retrieved January 1, 2016. ^ Bunting, William F. (January 1, 2015). "Jan 1, 2015 0830 UTC Day 3 Severe Thunderstorm Outlook". Storm Prediction Center. Norman, Oklahoma: National Oceanic and Atmospheric Administration. Retrieved January 5, 2015. ^ Peters, Jeffrey L. (January 2, 2015). "Jan 2, 2015 0700 UTC Day 2 Convective Outlook". Storm Prediction Center. Norman, Oklahoma: National Oceanic and Atmospheric Administration. Retrieved January 5, 2015. ^ Cohen, Ariel E. (January 2, 2015). "Jan 3, 2015 2000 UTC Day 1 Convective Outlook". Storm Prediction Center. Norman, Oklahoma: National Oceanic and Atmospheric Administration. Retrieved January 5, 2015. ^ Stephen Corfidi; Jaret Rogers (March 24, 2015). "Mar 24, 2015 1300 UTC Day 1 Convective Outlook". Norman, Oklahoma: Storm Prediction Center. Retrieved May 25, 2015. ^ "Severe Storms/Heavy Rain on March 24-26, 2015". National Weather Service Weather Forecast Office in Little Rock, Arkansas. March 28, 2015. Retrieved May 25, 2015. ^ Stephen Corfidi; Jaret Rogers (March 25, 2015). "Mar 25, 2015 1300 UTC Day 1 Convective Outlook". Storm Prediction Center. Retrieved May 25, 2015. ^ "Event Summary – March 25, 2015". National Weather Service Weather Forecast Office in Tulsa, Oklahoma. April 14, 2015. Retrieved May 25, 2015. ^ "March 25th, 2015 Severe Weather Event". National Weather Service Weather Forecast Office in Norman, Oklahoma. April 3, 2015. Retrieved May 25, 2015. ^ "Today's Storm Reports (1200 UTC - 1159 UTC)". Norman, Oklahoma: Storm Prediction Center. March 25, 2015. Retrieved May 25, 2015. ^ "Tornado rips through northern India". Washington Post. April 2, 2015. Retrieved April 23, 2015. ^ Ryan Jewell; Aaron Gleason (April 2, 2015). "Apr 2, 2015 0600 UTC Day 1 Convective Outlook". Storm Prediction Center. Norman, Oklahoma: National Oceanic and Atmospheric Administration. Retrieved April 8, 2015. ^ Ryan Jewell; Aaron Gleason (April 3, 2015). "Apr 3, 2015 0600 UTC Day 1 Convective Outlook". Storm Prediction Center. Norman, Oklahoma: National Oceanic and Atmospheric Administration. Retrieved April 8, 2015. ^ "Preliminary Storm Survey Info for April 2-3, 2015 Severe Storms". National Weather Service Weather Forecast Office in Springfield, Missouri. April 4, 2015. Retrieved May 25, 2015. ^ "Tornado kills 3, injures 5 in Myanmar northernmost state". CÍHAN. April 6, 2015. Archived from the original on April 23, 2015. Retrieved April 23, 2015. ^ Public Information Statement. National Weather Service Weather Forecast Office Chicago, Illinois (Report). National Oceanic and Atmospheric Administration. April 10, 2015. Archived from the original on April 10, 2015. Retrieved April 10, 2015. ^ a b "NWS Damage Assessment Toolkit". Apps.dat.noaa.gov. Retrieved May 7, 2015. ^ a b "Tornado Kills 2, Injures 120 in Southern Brazil". Rio de Janeiro, Brazil: ABC News. Associated Press. April 21, 2015. Retrieved April 23, 2015. ^ Angela Fritz (April 22, 2015). "Deadly tornado destroys parts of Xanxere city in Brazil". Washington Post. Retrieved April 23, 2015. ^ "Tornado as violent storms batter northern Germany". BBC News. Retrieved December 25, 2015. ^ "Vor 2 Jahren: Starker Tornado in Bützow". Thomas Sävert. Retrieved January 24, 2018. ^ "Tornado as violent storms batter northern Germany - BBC News". Bbc.co.uk. April 1, 2015. Retrieved May 7, 2015. ^ Baker, Jess. "Tornadoes, High Winds Damage Neighborhoods In Northern Germany; 1 Dead". weather.com. The Weather Channel. Retrieved May 7, 2015. ^ "Storm Prediction Center 20150505's Storm Reports". Retrieved December 25, 2015. ^ "Storm Prediction Center 20150509's Storm Reports". Retrieved December 25, 2015. ^ "One Dead One Critical From Tornado In Cisco". CBS DFW. CBS. May 9, 2015. Retrieved May 10, 2015. ^ "Storm Prediction Center Today's Storm Reports". Retrieved December 25, 2015. ^ Brinley, Bruton; Smith, Alexander (May 11, 2015). "Van, Texas, and Nashville, Arkansas, Hit by Suspected Tornadoes". nbcnews.com. NBC. Retrieved May 11, 2015. ^ "Storm Prediction Center 20150506's Storm Reports". Retrieved December 25, 2015. ^ "Storm Prediction Center Severe Weather Summaries". Retrieved December 25, 2015. ^ "Tornado-Schockstarre: "Es sah nur nach Gewitter aus... dann kamen schon die Bäume geflogen"". Focus (German magazine). May 14, 2015. Retrieved May 25, 2015. ^ "Tornado fegte mit bis zu 250 Stundenkilometern über Bayern hinweg". Focus (German magazine). May 14, 2015. Retrieved May 25, 2015. ^ "Auf der Spur der Verwüstung". Bayerischer Rundfunk. May 14, 2015. Retrieved May 25, 2015. ^ Südkurier Medienhaus. "Blumberg: Unwetter bei Ftzen: Tornado knickt Strommast - SDKURIER Online". SDKURIER Online. Retrieved December 25, 2015. ^ Badische Zeitung. "Münstertal". Retrieved December 25, 2015. ^ Staff writer (May 25, 2015). "Mexico tornado: Thirteen dead in Ciudad Acuna". BBC News. Retrieved May 25, 2015. ^ "'Supertornado' deja 13 muertos y centenar de viviendas dañadas". Retrieved December 25, 2015. ^ "National Weather Service Text Product Display". Retrieved December 25, 2015. ^ Spears, Chris. "Berthoud Tornado Strongest In Nearly A Decade, Rated As One Of Colorado's Rarest Twisters". denver.cbslocal.com. CBS Denver. Retrieved March 10, 2016. ^ Colorado Event Report: EF0 Tornado (Report). National Climatic Data Center. National Weather Service Weather Forecast Office in Boulder, Colorado. 2015. Retrieved November 3, 2015. ^ National Weather Service Weather Forecast Office in Grand Rapids, Michigan (June 23, 2015). Overview of Portland Michigan EF-1 Tornado 6/22/2015 (Report). National Oceanic and Atmospheric Administration. Retrieved June 23, 2015. ^ "Storm Levels Home in Monroe County". whotv.com. Retrieved December 25, 2015. ^ National Weather Service Weather Forecast Office in Des Moines, Iowa (June 23, 2015). NWS Damage Survey for 06/22/15 Tornado Event (Report). Iowa Environmental Mesonet. Archived from the original on June 23, 2015. Retrieved June 23, 2015. ^ National Weather Service Weather Forecast Office in Davenport, Iowa (June 22, 2015). "June 22, 2015 Storm Damage Surveys & Event Summary". National Oceanic and Atmospheric Administration. Retrieved June 22, 2015. ^ National Weather Service Weather Forecast Office in Chicago, Illinois (June 22, 2015). "June 22, 2015: Severe Weather Event". National Oceanic and Atmospheric Administration. Retrieved June 22, 2015. ^ National Weather Service Weather Forecast Office in Detroit, Michigan (June 23, 2015). "June 22-23, 2015 Tornado & Severe Weather Event". National Oceanic and Atmospheric Administration. Retrieved June 23, 2015. ^ a b c d e f g h i j k l "NWS Damage Assessment Toolkit". Retrieved December 25, 2015. ^ "Storm Prediction Center 20150623's Storm Reports". Retrieved December 25, 2015. ^ "Tornado riviera: la mappa della devastazione". Il Mattino di Padova. Retrieved December 25, 2015. ^ "Tornado Venezia, le incredibili immagini di Villa Fini (Dolo) completamente rasa al suolo [FOTO]". Meteo Web. Retrieved December 25, 2015. ^ "Voldsom tornado skabte store ødelæggelser nær Venedig". vejret.tv2.dk. Retrieved December 25, 2015. ^ "Violent tornado rips through Venice's Riviera del Brenta". Demotix. Archived from the original on November 5, 2015. Retrieved December 25, 2015. ^ "Tornado in Riviera del Brenta: un morto e 72 feriti". Il Mattino di Padova. July 9, 2015. Retrieved December 25, 2015. ^ "Tromba d'aria sulla Riviera del Brenta". Retrieved December 25, 2015. ^ "Il tornado tra Mira e Dolo (VE) dell'8 luglio 2015". Associazione MeteoNetwork ONLUS. Archived from the original on July 10, 2015. Retrieved December 25, 2015. ^ NWS Damage Survey for 07/16/15 Tornado Event - Final Update. National Weather Service Weather Forecast Office in Quad Cities, Iowa (Report). National Oceanic and Atmospheric Administration. July 17, 2015. Archived from the original on July 17, 2015. Retrieved July 17, 2015. ^ NWS Damage Survey for 7/16/15 Delavan Tornado. National Weather Service Weather Forecast Office in Lincoln, Illinois (Report). National Oceanic and Atmospheric Administration. July 17, 2015. Archived from the original on July 17, 2015. Retrieved July 17, 2015. ^ Lara Schroeder (July 28, 2015). "Manitoba tornado lasted 'incredible' 2.5 to 3 hours: Environment Canada". Global News. Retrieved December 25, 2015. ^ "3-hour Canadian tornado likely one of world's longest". USA TODAY. July 29, 2015. Retrieved December 25, 2015. ^ "Tornado that hit southwestern Manitoba gets early rating of 'high-end EF2'". Winnipeg. Retrieved December 25, 2015. 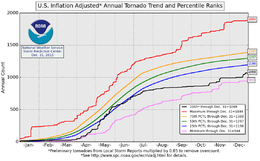 ^ a b "2015 A Record Year For Tornadoes In Chicago Area". Retrieved December 25, 2015. ^ Christie Green (August 20, 2015). "CBS 58 - Third tornado confirmed from Tuesday night's storm". Retrieved December 25, 2015. ^ "Tornado richt ravage aan in polder". telegraaf.nl. Retrieved December 25, 2015. ^ "Diederik van Arkel". Twitter. Retrieved December 25, 2015. ^ "Tornado leaves trail of destruction in Dubbo". The Sydney Morning Herald. Retrieved December 25, 2015. ^ "'It was like a scream': Dubbo woman describes moment tornado tore through her property". news. Retrieved December 25, 2015. ^ "A devastating tornado wreaks havoc across Charente-Maritime, France". The Watchers - Watching the world evolve and transform. Retrieved December 25, 2015. ^ Bjoern Weil (October 30, 2013). "F2 Tornado - Sonnac / France - Tornado Map". Retrieved December 25, 2015. ^ "Storm Prediction Center Monthly Climatology - October 2015". Retrieved December 25, 2015. ^ "Seven dead and 223 injured as tornadoes brought by Typhoon Mujigae ravaged China's Guangdong province". South China Morning Post. October 5, 2015. Retrieved December 25, 2015. ^ "Small Tornadoes Join the Flood Party in Willacy County Before Sunrise, October 30, 2015". Retrieved December 25, 2015. ^ "NWSChat - NOAA's National Weather Service". Retrieved December 25, 2015. ^ a b "NWSChat - NOAA's National Weather Service". Retrieved December 25, 2015. ^ "Victorian woman films moment tornado tore through her town". 9news.com.au. 9 News. November 2, 2015. Retrieved November 2, 2015. ^ "Three homes left uninhabitable by severe storms in Victoria's north". Weatherzone.com.au. ABC News. November 2, 2015. Retrieved November 2, 2015. ^ "Thunderstorms bring widespread rain to VIC and NSW". Weatherzone.com.au. Weatherzone. November 2, 2015. Retrieved November 2, 2015. ^ "Summary of The November 11, 2015 Veterans Day Tornadoes". Retrieved December 25, 2015. ^ "Nov. 11, 2015 Event Summary". Retrieved December 25, 2015. ^ a b "PNS from KDDC". Retrieved December 25, 2015. ^ "NWS". Retrieved December 25, 2015. ^ "Storm Prediction Center 20151116's Storm Reports". Retrieved December 25, 2015. ^ "Storm Prediction Center 20151117's Storm Reports". Retrieved December 25, 2015. ^ "Storm Prediction Center 20151118's Storm Reports". Retrieved December 25, 2015. ^ "G1 - Tornado atinge Marechal Cândido Rondon e deixa rastro de destruição - notícias em Oeste e Sudoeste". Oeste e Sudoeste. Retrieved December 25, 2015. ^ "Tornado atinge cidade no Paraná, fere 20 e danifica 1.500 casas". Retrieved December 25, 2015. ^ "Tornado atinge Marechal Cândido Rondon". Gazeta do Povo. Retrieved December 25, 2015. ^ "G1 - Inmet confirma passagem de tornado em Chapecó, SC; houve feridos - notícias em Santa Catarina". Santa Catarina. Retrieved December 25, 2015. ^ "G1 - Além de Chapecó, Inmet confirma também tornado em Treze Tílias, SC - notícias em Santa Catarina". Santa Catarina. Retrieved December 25, 2015. ^ a b c d "Sydney tornado: Clean-up underway in Kurnell after 'unprecedented' storm delivers 213kph winds". ABC News. December 16, 2015. Retrieved December 17, 2015. ^ "Kurnell 24 Hour Observations". Daily Observations. Weatherzone. December 16, 2015. Retrieved December 18, 2015. ^ a b c "Storm Prediction Center Yesterday's Storm Reports". Retrieved December 25, 2015. ^ "EF-1 tornado confirmed; Michigan's first December tornado since records began". MLive.com. Retrieved December 25, 2015. ^ Reuters - News agency (December 24, 2015). "News - Southern states clean up after storms kill at least 10 - The Weather Network". The Weather Network. Retrieved December 25, 2015. ^ "Boy Among 7 Dead, 40 Injured in Tornado and Severe Storm Outbreak". ABC News. Retrieved December 24, 2015. ^ "Particularly Dangerous Situation Tornado Watch Issued: Outbreak of Severe Weather Underway in the South, Ohio Valley". weather.com. December 23, 2015. Retrieved December 23, 2015. ^ "6 dead, state of emergency declared after severe weather". The Tennessean. December 23, 2015. Retrieved December 25, 2015. ^ "Flooding Causes Road Closures and Structural Damage Across South After Deadly Tornado Outbreak". The Weather Channel. December 26, 2015. Retrieved December 26, 2015. ^ Texas Event Report: EF4 Tornado (Report). National Climatic Data Center. National Weather Service Weather Forecast Office in Fort Worth, Texas. 2015. Retrieved May 1, 2016. ^ Texas Event Report: EF2 Tornado (Report). National Climatic Data Center. National Weather Service Weather Forecast Office in Fort Worth, Texas. 2015. Retrieved May 1, 2016. ^ "Eleven killed in Dallas area amid tornadoes, flooding". Reuters. Retrieved December 27, 2015. ^ "Garland tornado that killed 8 classified as EF4; 3 others killed in Collin County". The Dallas Morning News. Retrieved December 27, 2015. ^ "Man injured by Garland tornado dies; death toll to 12". KSAT. Associated Press. January 9, 2016. Retrieved January 14, 2016. ^ NWS Damage Survey for December 26th Tornado Event (Report). National Weather Service Office in Fort Worth, Texas. December 29, 2015. Archived from the original on December 30, 2015. Retrieved December 30, 2015. ^ NWS Damage Survey for 12/28/2015 Tornado Event (Report). National Weather Service Office in Memphis, Tennessee. December 28, 2015. Archived from the original on December 30, 2015. Retrieved December 30, 2015.